Courtyard homes give the privacy you need and yet provide the casual Florida lifestyle you’ve only dreamt. 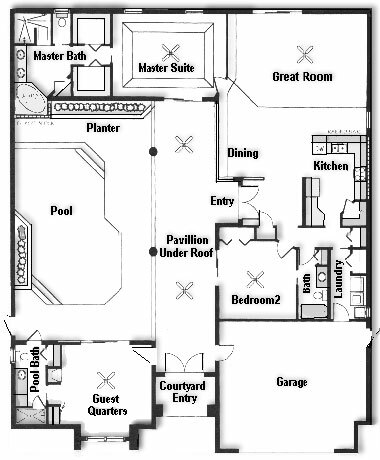 The below beautiful Courtyard house plans were built in Cape Coral Florida. If you would like to see what is available in resale homes or the new construction market our team will show you everything that meets your criteria. A courtyard home is a plan the majority of the time will have a cbs block wall 8 to 10 feet high surrounding the patio or pool area tied into the exterior block walls of the home. Normally it will have a screen enclosed roof area. Some of the more positive points of this type of plan are. Privacy: Swimming or sunbathing in the pool without the neighbors being able to see you..
Security: A 10ft cbs block wall surrounding your patio area will bring you a much well earned sense of security. Sound Reduction: With the wall, noise from the road and your neighbors is greatly reduced. Noise from any pool parties you may give will be concentrated to your own home and it will not bother your neighbors. 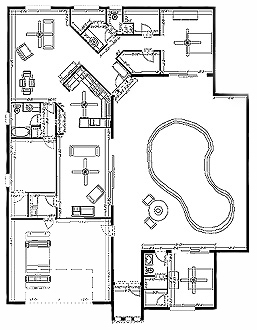 Guest Quarters: This plan provides for those friends or family who need their own space. 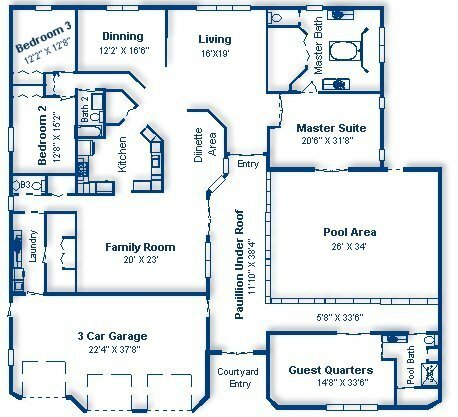 Due to their design features, courtyard homes always cost more to build than traditional floor plans of similar size. Never underestimate the cost of new construction, although a builder may advertise a home with a base price of $150,000, $200,000 or $300,000, this is not the final cost. There are many factors that must be added to the builder’s base price to determine your final cost. • The price of the homesite. Which we will assist you in finding. Lot values in the Lee County area can vary greatly because of location, view, size and the availability of city utilities. • Pending or planned utility assessments against the property. • Any changes, modifications or optional items the home buyer may add to the builder’s basic specifications. The best way to determine the final cost of any new home is to sit down with our new construction specialist. He will familiarize you with our database of quality Southwest Florida builders, including their floor plans and prices, and after a diligent search through the MLS, help you decide on the best location. He will then negotiate the contract for that lot with the listing office. We’ll accompany you to different builder's models and point out all of the construction techniques and cosmetic features, both positive and negative. We’ll then prepare an easily understood cost analysis comparing the builders you’ve selected. We will then assist you in negotiations with that builder to assure you that the contract doesn’t contain any hidden costs. This is all done at no additional cost to you. If you would like to see more courtyard plans go to . Finally, we stay with you throughout the entire construction process. We’ll photograph your home regularly and post the photos to a website so that you, your family and friends can stay up to date on the construction progress. Once construction is complete, we’ll help you make your final inspection to ensure that every single detail meets or exceeds your expectations. I would like to make clear, that Tamure is not a builder or contractor, Tamure is a licensed real estate corporation in the state of Florida. Working as single agent representing only buyers in real estate transactions at no additional costs to the buyer. The below beautiful Courtyard home was built in Cape Coral Florida. Recently one of our many clients became interested in courtyard homes and wanted to see what was available in resales and new construction. After showing them all the resale courtyard homes that met their criteria they decided to go with building a new home. The below presentation is a photo tour of that home from start to finish.